Dermatology is one of my favorite areas of veterinary medicine. I don’t know if it’s because of the investigative nature of the conditions (diagnosis is based on a thorough analysis of the pets’ environment, habits, lifestyle, risk factors, exposures etc.) or the fact that when we do solve the mystery of what is causing the issue it is almost always manageable and rarely a grave prognosis. Dermatology symptoms include itching, hair loss and rashes. 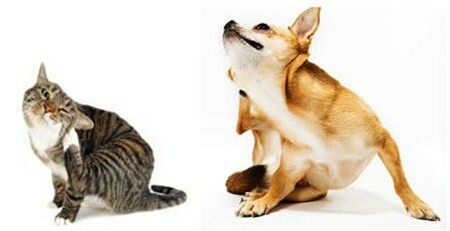 When a pet is itchy you may see excessive licking, biting, scratching or chewing of a specific area. Sometimes it is the extreme itching that causes the rash and/or hair loss. In other cases, it is the rash that has created the itching. Often the itching is caused by a skin infection and, while this is something we need to diagnose and treat, it will return if we don’t identify the primary cause of the infection. Just like humans who have allergies, the reaction itself can be treated, but will reoccur if we are exposed to the allergen again. When a patient presents with a dermatology condition we always begin by taking a thorough history and doing a complete physical examination. Based on our findings and discussions with you we will likely run some dermatological tests to help us narrow down our diagnosis and also identify any secondary issues which will need to be treated as we work to identify the root cause. Our first rule out is always parasites. There are several external parasites that can cause itching. Sarcoptic mange (microscopic) and fleas (can be seen with the naked eye) are the two most common parasites we see. Fleas are not only the source of a condition known as flea allergy dermatitis (literally a skin infection caused by an allergy to fleas) but they also transmit tapeworms and so we must immediately treat for these internal parasites if we note a flea infestation. Fleas reproduce very quickly and can wreak havoc within your home. Severe infestations may cause anemia and so getting the situation under control quickly is imperative. Sarcoptic mange is extremely itchy and we will often see secondary skin infections and hair loss with this infestation. They live within the skin layers of your pet and the condition is highly contagious. Like fleas, they can spread to your other pets and will even bite humans. Often they are difficult to find, even with testing, and so treating for them is sometimes the only way to diagnose and cure your pet. In cats, persistent scratching commonly causes severe skin damage resulting in open wounds. Apart from mange and fleas, in cats we are likely to suspect ringworm. Ringworm presents as one or more irregular or circular bald spots. You may also notice strange colouration of the skin and excessive dryness as well as broken hairs caused by the cat biting at the area. Any broken hairs or dry skin scales around your house can help to spread ringworm and so we want to be very careful if we suspect this condition to minimize the contamination as we work to treat the condition. If parasites have been ruled out as the cause of your pets’ skin condition then we focus our attention to allergies. Both food and environmental allergies are to be ruled out based on information gathered that is specific to your pet. Atopic dermatitis is a genetic predisposition that leads to a pet developing skin issues from exposure to normally harmless substances including pollens, house dust mites and mold spores. Food allergy dermatitis can present as a skin infection – or even just as chronic ear infections! Chronic ear infections are a common symptom of allergies and so any itchiness, discharge or smell within the ear should be brought to our attention as soon as possible so that we can identify the cause and remove any discomfort your pet is feeling. Dermatology is an area of veterinary medicine that requires the veterinary team to work very closely with you, the pet owner, in order to ensure successful outcomes for our patients. You know your pet best and so your knowledge and attention to detail enables us to hone in on what our focus should be so that we can quickly and effectively manage your pets condition whether acutely (a parasite infestation) or chronically (allergies). If you suspect that your pet may have a dermatological condition please contact the Westway Animal Clinic team to discuss your options today!